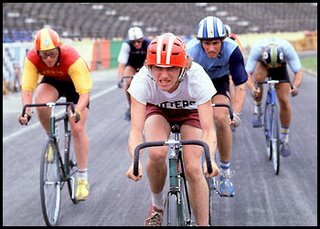 After the racing, Save the Velodrome will be hosting a free night of have-a-go riding on the track, and a bicycle powered outdoor film night (part of the 2011 Peckham and Nunhead Free Film Festivals, 8-18 September), showing the cycling classic, Breaking Away. Breaking Away (dir Paul Yates, 1979, cert 12, 101 mins) is an unerringly accurate coming of-age story about four discontented blue-collar 18-year-old boys spending their last summer of freedom in a midwestern university town, unemployed and patronised by snobbish students. Date: Sunday 11th September. Doors open 7pm. Another amazing event that we are really proud to be involve in. Please drop us a line if we can use your bicycle to power the film! Thanks.